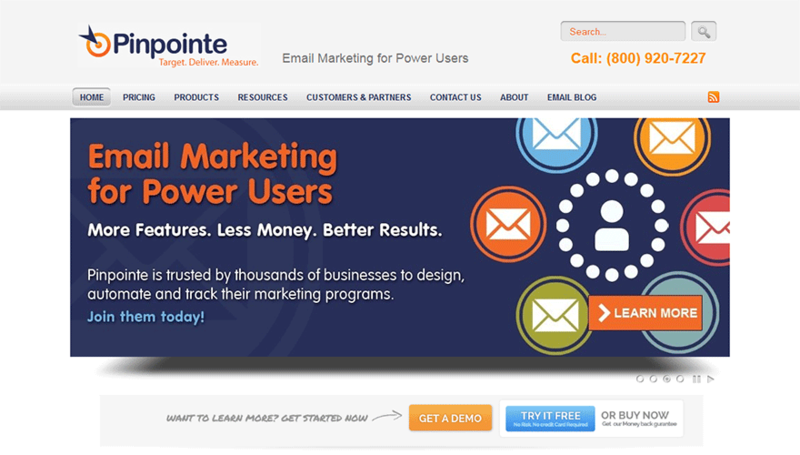 Pinpointe is a cloud-based email marketing software product with which you can send out bulk emails in large volumes and provide for all your B2B communication needs. Marketed to large volume customers and dedicated to giving mid-sized companies the edge needed to compete with larger entities, Pinpointe has earned the attention of TopFiveAdvisor and we took a closer look at the interface that has shown itself to be an impressive product. Pinpointe is a company based out of Silicon Valley, CA, founded in 2009. It is a small outfit of about ten permanent employees at the time of this review, yet still serves a broad customer base through effective automation. The company specializes in B2B solutions, Email Marketing Campaigns, and Web based Surveys.This is a newer company to the market and is a hungry contender with a results-driven business model that takes a lean-and-mean approach to providing a solid product to mid-sized businesses. After careful review of other various resources, we’ve found customer satisfaction one of the highest we’ve seen. Excellent feature set and options available on all plans. Pinpointe offers competitive pricing; however unless you use this site or other promotional resources, has a higher entry price than most other email marketing companies. Bypass that by using our promotion on the right to start with their $29 rate. The Pinpointe interface is the hub of all tasks available to a B2B customer seeking enterprise Email solutions. It is divided up succinctly into tasks ranging from contact management to emails and surveys, providing statistical tracking and social network platforms to enhance these features. It has an elegantly simple design that shows an understanding of the fundamental principles of human-centered planning. It is truly meant to provide powerful B2B tools to people along a broad continuum of technological proficiency. You do not need to be an expert to successfully manage your email campaigns with Pinpointe’s interface. Taking a look at the back end, one can easily see that the layout is done in an intuitive way with drop-down menus that organize tasks in a logical fashion and group them more or less in the order that you would need to check them on a daily basis. This makes the user experience a simple left-to-right proposition that’s easy to get acclimated to. Its homepage provides access to all of these drop-downs upon login as well as convenient access to the support center and live chat functions. Seven day statistics are provided immediately upon login, giving you an instant snapshot of your performance in customer retention as well as the overall reach of your campaign. Statistics include detailed in-depth data regarding specific autoresponder statistics, contacts list statistics, your user account statistics as well as overall email campaign statistics. Statistic parameters include subscriber data, bounces, forwards, spam complaints, the number of emails sent, number of emails opened, total opens, unique opens and more. The contact listing and contact tabs make it very easy to manage all of your contact lists, whether you have two main listings or several sub-listings that need to be managed separately. As you can see here, creating a list is made extremely simple, as users need only enter their name, email and a reply-to email, along with any number of custom fields that they would like to use to further segment their contacts list. These include demographics such as city, company, name and industry. This flexibility and specificity gives you the ability to manage multiple mutually exclusive and sensitive projects with very few headaches. Another great feature, is the ability to load contacts for any email list from a separate file. Through their simple CSV uploader, users can add any number of contacts from previous or concurrent email campaigns. In the event that you have a campaign where you may find traction in any number of your lists, you have the capacity to view a master list of all contacts and import or export specific contacts from multiple listings to a new list. This is a force multiplier in quickly assembling new campaigns, making this feature very impressive. Generate ‘heat maps’ (like eye-tracking for your websites). See exactly where visitors are clicking. Pinpointe’s strength is in this feature, as it is obvious that they strove for both ease-of-use and flexibility in generating and sending mass mailings. In a single sitting, you can view the results of previous campaigns, generate new ones, check for terms which may cause problems with spam filters and generate new tags. Creating an email campaign is simpler than ever, as users get a choice between different premade and custom templates that they have saved from previous campaigns. Users can also choose between and HTML-based, Text-based campaign or both. Users can also split-test alternate versions of an email to see which will be more efficient as well as manage images imbedded in your emails to maximize their effect. If a campaign is time-sensitive, the Email campaign interface makes it easy to schedule the mailing for a time when you may need to be away from the computer. Autoresponders make it easy and convenient to follow-up with specific contacts and you can create imbedded links, which trigger autoresponders from specific departments. Pinpoint Email Marketing boasts a highly robust survey creation interface, where users can choose from a nearly endless array of features. Some of these include question format (multiple choice, essay or single line of text), drop down lists for locations, file upload box, text responses with numerical values as well as rating scale questions amongst many anothers. With this feature, the options are literally endless when it comes to being able to create unique and engaging surveys for email recipients. The first level of support that the Pinpointe interface provides is its step-by-step tutorial. This simple introduction is very effective in introducing novice mass marketers to the powerful tools that this interface provides. Users enjoy access to Pinpoints extensive knowedgebase, which contains more than a simple FAQ section found in most other sites. It includes a nearly encyclopedic database of potential problems and pitfalls that you can overcome while performing various tasks. Some of these topics include help with creating contact lists, autoresponders, triggers and ensuring successful delivery of emails during a campaign. The self-help portion of customer support is enhanced through the ease of accessing live support. Live support by chat is accessible by clicking a prominent button on the center of the console and then filling in the name, email and question fields. One drawback, is that, with few employees, the live chat function is often offline. In these cases, email support usually has a two-hour turnaround with support tickets (with only 20% of tickets taking any additional time). Given that this is a highly technical interface with a great deal that could potentially go wrong, this is an area where Pinpointe could see some improvement. An investment in manpower is clearly needed at this level. Although the service rarely shows any signs of instability or technical problems, this could be an issue down the line. Email support via Pinpointe’s ticketing system is available from 9am EST to 9PM EST and on weekends. Along with live customer support, you’ll find access to a knowledge base you can use to hunt down answers to your questions on your own as well as video tutorials which make it easy to learn how to use the program. Free live webinars hosted by email marketing experts help you learn how to get more out of your platform. Pinpointe’s email marketing interface has a variety of features that will improve your B2B efficiency and help you a hit the ground running when it comes time for you to implement marketing campaigns using mass email. You will be able to effectively manage both your lists and mailings with minimal effort and maximum effect. Your subscribers will see the difference, as they are able to select links that will route them to the department that will most serve their needs and you will find the overall interface to be extremely easy to use. This is a good email marketing service that will meet your mass marketing needs and help you grow your business.